Add the dates, pumpkin, coconut milk, coconut butter, pie spice, vanilla, and salt into a high speed blender or food processor. Blend until smooth. Line up small muffin liners onto a baking tray or plate. In a double boiler, melt the chocolate. Pour some chocolate into the bottom of each muffin cup. Use a spoon to spread it up the sides. Chill in the fridge until set, about 10 minutes. 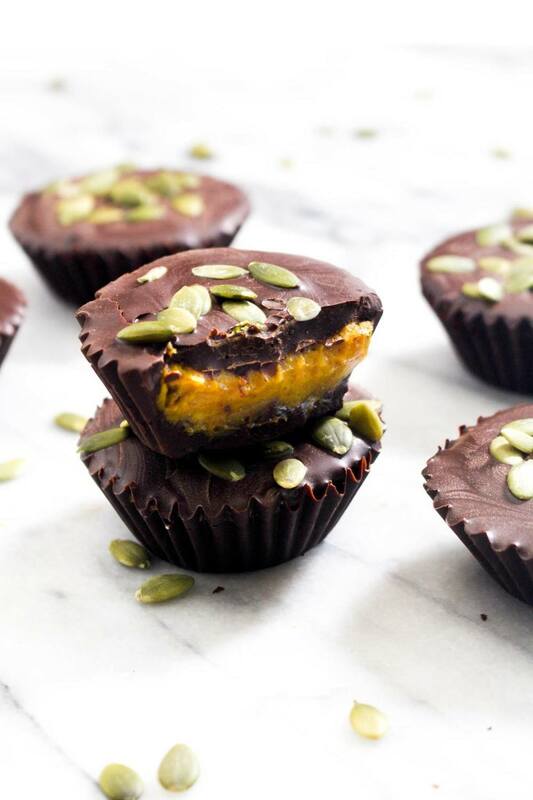 Add a spoonful of the pumpkin caramel into each cup. Top with more chocolate and a sprinkle of pumpkin seeds. Once the chocolate is set, serve.